Relocation is a strange combination of happiness and anxiety. Although the stress of packing and moving is high, it also spells excitement and thrill. Moving to a new location brings along a plethora of opportunities to rise and grow. But the whole process is physically exhausting and financially draining. Enlisting services of a professional mover can however help you enjoy a perfect move without much effort and financial dent. 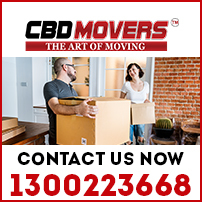 At CBD Movers™, we are the finest and most trusted movers in Melbourne. Well known for proficient support staff and advanced equipment, we offer a wide range of removal services that help you move effortlessly. Right from planning to packing and moving stuff, we offer end-to-end solutions for a positive and pleasant relocation. At CBD Movers, we take pride in our wide range of moving services. We understand the varied requirements of clients and offer customized services to cater to the distinct needs and requirements in full. We are committed to providing quality services at pocket-friendly rates. Our ‘Movers & Packers’ service is apt for comprehensive shifting of office and home set-ups. The ‘Two Men & Truck’ deal helps move fragile items and heavy furniture like pool tables, pianos, etc with ease and competence. We specialize in packing and use quality packing material and skillful techniques to dissemble and reassemble furniture and equipment. We own a huge fleet of trucks. Each vehicle is befitted with latest supportive equipment to impart maximum protection to goods during transit. We comply with the stringent industry norms and possess the mandatory license and permits required for a hassle-free local, interstate and international removal. At CBD Movers, we are well renowned for own fine services and inexpensive rates. Our policy to slash every written quote by 10% makes us the cheapest movers in Melbourne. We also offer comprehensive insurance cover for enhanced protection and safety of goods during transit. All our operations are transparent with no hidden charges. Narre Warren, a suburb of Melbourne, Victoria, Australia, is 38 kilometers southeast of Melbourne Central Business District. From an underdeveloped semi-rural residential suburb to a major infrastructural hub, Narre Warren has witnessed all. Today, Narre Warren is home to nearly 26,000 people. 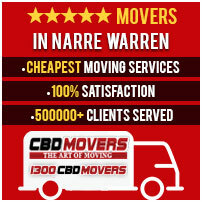 At CBD Movers, we extend our services and support to help people move in and out of Narre Warren with ease and competence. Our services are safe, reliable and extremely affordable. Call us at 1300 223 668, to know more about our hassle-free ways to relocate.